If none of the homes in the Sears Modern Homes catalog caught your eye, you could have Sears design you a custom model. In 1931 a building permit was filed with the Village of Glencoe for a custom-designed Sears house on Monroe Street. The building permit from April 1931. Scan courtesy of the Village of Glencoe (Nathan J. Parch). 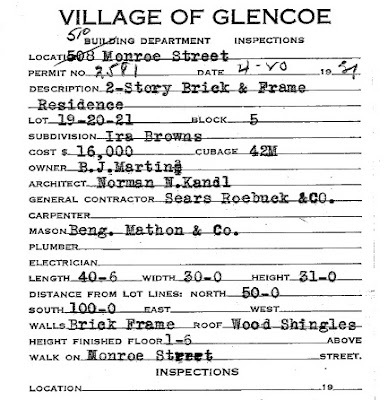 The building permit states that the architect was Norman N. Kandl (on the second page of the permit, it states that Kandl worked for Sears Roebuck). The general contractor was Sears Roebuck & Co.
What is strange is that Sears ran an advertisement in the Chicago Daily News that featured the house in Glencoe, but the ad said the house was designed by David S. Betcone. According to the permit, B.J. Martin paid $16,000 for the house. That was Burrous J. Martin, a publisher of electrical magazines. Tragically Burrous died in an American Airlines crash in 1959. The house is still owned by the Martin family. Burrous Martin on the far right, from the Chicago Tribune. Very interesting find. So sad about the plane crash. How awful for that family. I have found a number of custom builds in St. Louis, with Sears mortgages. Or, maybe they were mortgages for supplies, and the folks already had blueprints. All I know, is they sure aren't Sears models :) I should see if I can get building permits. I just got the new Judy Blume book, "In the Unlikely Event" and it is set in the 1950's when plane crashes were occurring frequently in the New York area. This 1959 crash that Burrous was in was a famous one. An eight-year-old boy was pulled out of the debris in the water. Honestly, I haven't read the book yet because I just finished reading all the news reports about the 1959 crash and feel weird about it.